Enjoy the convenience of a single cup coffee maker without the high cost of big brewing machines. 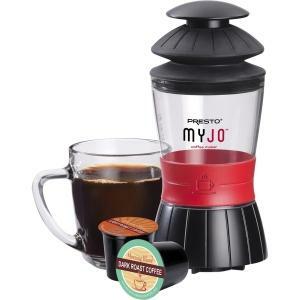 MyJo** uses K-Cup* packs and other single serve cups to brew your favorite coffee, tea, and hot cocoa. Best of all, MyJo** goes where you go! Its portable, compact design is great for home, work, school, travel, even camping. The convenience of a single cup coffee maker without the high cost. Uses K-Cup* packs and other single serve cups to make coffee, tea, and hot cocoa. Compact, portable design is great for home, work, school, travel, even camping. Brews 6-, 8-, or 10-ounce servings. Slip- and heat-resistant silicone grip provides easy handling. Works with most travel and coffee mugs. Easy to use! Fill reservoir with hot water from a tea kettle or heat filled reservoir in a microwave. Place assembled coffee maker on top of your favorite coffee mug, then pump heated water through K-Cup* pack to brew. Easy to clean! Toss the K-Cup pack and rinse base. * Presto is a registered trademark of National Presto Industries, Inc. in the United States of America and/or other countries. K-Cup is a registered trademark of Keurig, Inc. Presto is not affiliated with Keurig, Inc. **MyJo is a trademark of National Presto Industries, Inc. in the United States of America and/or other countries.